Lately it seems the trend is to copy off of Christian artists in hopes no one would notice. First it is the controversy over Kate Perry's "Dark Horse" and Flame's "Joyful Noise." Then it was Tyler Perry and the controversy over whether he stole the idea of the "What Would Jesus Do" show. Now it is Demi Lovato's fashion choice in relation to Superchick's Tricia. Tricia's husband, Nick Baumhardt, wrote on blog on the similarities between Lovato's outfit in a new music video as compared to his wife's in a photoshoot. "Our entire culture of music and the way it evolves from one style to another is based on copying," Baumhardt wrote on his blog, opening it up. "Band A comes out with a fresh, new sound. Then band B copies it, but adds a little twist on it to create something new. Then band C copies that with their own twist, then so on and so forth. The same holds true in fashion. In fact, a large part of art in general is derivative and borrows elements from other art." He sites that Lovato is aware of Superchick and Tricia even though she is a Christian artist, because she had previously Tweeted lyrics to a song by them called "Courage." During that time it was widely rumored that Lovato was battling with anorexia, and the song distinctly talks about that battle. See that picture along with the lyrics to the song here. He then addresses Lovato's new music video in which she wears an outfit strikingly similar to what Tricia wore in a photoshoot this year. "black suit jacket, skinny black tie and white shirt? i feel like I've seen this before. lots of gold bangle bracelets and dangly earrings. striking a pose with hands on hips," he wrote. "bright red lips, hair shaved on one side, tips colored pink. this seems really familiar. oh wait! i know where i've seen this before!" He then posted promo photos of his wife from over a year ago for her album Radiate. In this photos she is dressed in almost identical fashion as to what Lovato is wearing. 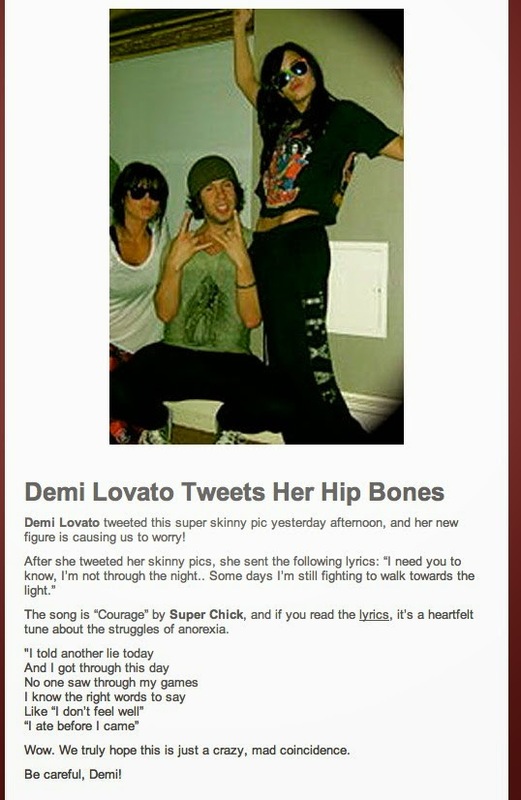 "We know Demi is a Superchick fan. I think it's entirely possible, and even probable that she saw Tricia's promo pictures sometime in the last year and used it as an inspiration in her look for this video. No, I am not bashing Demi. I actually really like her voice and some of her songs," he continued. "I just want to point out that my wife is awesome and quite possibly provided visual inspiration for a very popular pop star. If somehow Demi is reading this and is somehow still mad, be mad at me and not Tricia. She doesn't even know I'm writing this." See the first image here and the second one here. What do you think? Did Lovato lift her look from Superchick's Tricia?